A friend of mine that has recently started the covenant (along with a fast from Facebook and several TV shows… you go girl!) 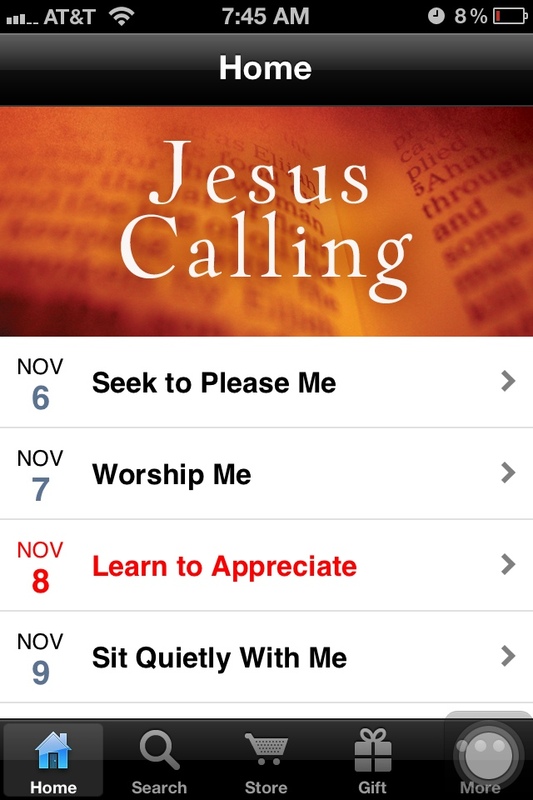 recommended the devotional Jesus Calling. She told me there was an app and so I thought I’d check it out. I’m a bit of a devotional snob… as in, I am terribly picky about them and almost never read them. BUT, I love apps so I simply couldn’t resist looking into it! 1) It is from “Jesus’s” point of view. Not His actual words but based on His Words. It really does feel like Him… calling. speaking. encouraging. challenging. 2) There are always scriptures at the end that support what was just written. A couple of times if the writings didn’t snag my soul then the scriptures have done so. But for the days where the writing really hits it, the scriptures just come behind and solidify the revelation. 3) Hate to say that this is a “selling-point” for me, but it is… the devotionals are short. Of course I prefer days when I am not interrupted during my 6am readings or prayers, but… kids like to wake up early when you need them to sleep in. It’s just a fact of life! So, this is a great boon on those days when I might not otherwise have gotten anything for my soul. Alright… that was my little “check it out” speech. I promise that I didn’t get paid or whatever for all that. It’s just that when I find something that I think is spiritually encouraging, I love to share. Cause if something will crack through my hard heart then it is typically good for just about anyone! A quick glance at Me is all you need to make the right choice. I mean…… bam. That was all I needed to help me get through the past few days. I had been really struggling lately with the “little bites” of food sitting around. The leftover homemade donut bite. The remains of a jelly sandwich. (Yes, you heard me right… a jelly sandwich… my 5 year-old doesn’t eat a peanut butter and jelly sandwich. Nope. Just jelly.) The three or four uneaten goldfish crackers destined for the compost bin. And through those moments I found one of the accompanying verses exceptionally accurate! My true heart’s desire is not to eat a leftover goldfish cracker. My heart’s desire is to be free of the things of this world (right now, food). And I delighted myself in God’s power and loving spirit and He gave me the true desire of my heart… freedom.